How Is That Possible? The Smart French Patent-pending Revolutionary System Teaches You How The French Link Their Words Together And Chop Them Up When They Speak, So That You Get To Speak French The Way The French Natives Do. The Patent Pending Smart French Method Is 100 % Guaranteed and Backed By Our 6-Month Money Back Guarantee. You may want to start with our Introduction to French, Volume 1 & 2 to learn basic conjugation, grammar and vocabulary. Or you may choose to start directly with the Audio CDs Beginner to work on real life conversations. You will gain the knowledge to not only speak French, but also speak French effectively. 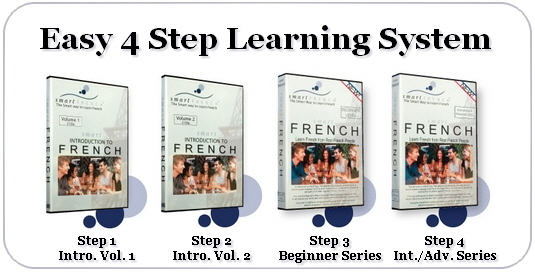 By using both programs simultaneously you will have a well rounded introduction to French. We make learning French fun! We teach French through actual, real life conversations which make learning French totally natural. Our guests talk about the subject of their choice, with good humor and "joie de vivre." If you travel for pleasure or for business or if you just want to study French, you will benefit from SmartFrench. We sincerely hope you will have a wonderful time learning French with SmartFrench. "I just can't recommend this program enough. It is something you will keep forever in your library... Go and buy SmartFrench. It's a good investment and you won't regret it." "I just want to say 'Thank you, SmartFrench.' You've developed a product that is really amazing... It works like a champ... I really like the approach... Keep up the great job. I really like the SmartFrench products."